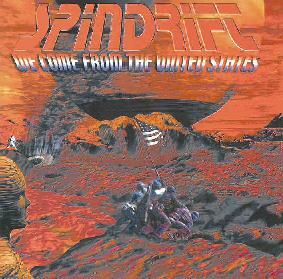 Spindrift - "We Come From The United States"
Spindrift obviously come from the United States, from Wilmington, Delaware to be specific. A trio with various guests (including producer Bill Grabowski on keys/loops), Spindrift are often like a campier, punkier version of Calvert-era Hawkwind. Maybe not so clever in some ways, but they've also got some other individual charms to offer. As lead vocalist, guitarist, and chief synth/electronics handler, Kevin Thomas is undoubtedly the group's protagonist and while not a virtuoso/show-off, he's no hack either. I've had this disc for a few months, and while I was rather disappointed with it back then, I found this latest listen to be a more positive experience. So perhaps it'll take yet longer for my full impression to completely crystallize. Some of the punkier tunes (like "Komputerized") are a little 'much' and are just so forward and aggressive (in a way) that I was taken aback at first. However, I've grown to discover that I rather enjoy some tracks like the more cosmic "Space Chamber/Soda Fever" that actually leads off the album. And the psych-funk (have you heard Kava Kava?) of "Secret Rendezvous" gets a definite thumbs up now. Spindrift hit full throttle with "Damn'it! We've Got To Get Off This Planet," Thomas' voice becoming monotone and shouty, but then that's what this rapid-fire space-punk-blanga calls for I guess. Oh wait, "Queen of the Hive" even tops this... we're now into Helios Creed territory - I love this leaden buzz-guitar sound. As the album progresses though, Thomas' vocals are becoming more and more ridiculous, and he's gone from being a peculiarity to a detriment. Too bad, some of the later songs are pretty interesting otherwise. As the title suggests, "Freeform Freakout" is an exception, a 4 1/2 minute side trip into crazed jamming and only the occasional yelp from Thomas' mouth. Next, the stoner tune "Planet of Women" sees the rhythm section of Zachary Hansen on drums and Joe Baluta on bass finally reach 11 on their respective volume controls. To close, a rousing rendition of "Hurricane Fighter Plane" by Red Crayola (Hey Guys!! Where's the proper credit given?) and the stately 11 minute "Space is Between the Ears" finish off the hour-long album on a high note. All in all, my first exposure to Spindrift still leaves a few unanswered questions, like... Is Thomas going to reign in his own outlandish vocal style? If he does, even a little, I think Spindrift will be a band to seriously check out in the future. I now recognize that they cover a lot of territory here and could go in numerous directions from this point. This effort I have to give a middling grade, but one that presents great hope for future releases. Note: Since the recording of the CD, a second guitarist Blair Warner has joined the group. An earlier lineup released the CD 'Strange Range' in 1996. You can visit Spindrift at their web site.